Probably by now, most of you my dear readers know I’m a discerning coffee addict. Even my tweets have an occasional random spurts talking about coffee. Anyway, I recently came across Le Creuset‘s newest product for coffee – the French press and it’s in a beautiful, vibrant Marseille blue. Le Creuset is one of the best companies who produces cast iron cookware, their signature is the (very heavy but very reliable) French Oven, as well as a very expansive line of stainless steel pans, bakeware, and recently objects for the table. Have a pot of boiling water and slowly saturate your freshly ground coffee so that it “blooms” (a gaseous, bubbling action that is normal for fresh coffee) and stop adding about 1 to 1.5 inches away from the top since you need space for the filter. Optional: Stir the coffee grounds with wooden chopsticks for even flavor extraction – about 6 times. Assemble the filter on top and let it steep for about 3 to 4 minutes. Press down the plunge (the shiny silver knob on the Le Creuset) evenly and slowly so it will not be crooked. Crooked = coffee grinds escape = unpleasant cup of coffee. Pour that flavorful coffee in your cup. Just hold the top while you pour, in case it does slides down. This should yield about 4-6 cups, depending upon how large is your cup or mug. It’s overall a simple technique. Le Creuset’s French press is different than other French presses because it’s made with enamel stoneware so it’s less prone to damage and it has less porosity, making it resistant to staining and leaks. Update: Comments are closed. I have to end this early because of a meeting I have to attend. The winner is Nancy (Commenter #1)! Congratulations! Please check your email for further info. Many thanks to all who entered and participated on this contest. Please stay tuned via Twitter or on this blog for any future contests and giveaways! Hope you all have a great Easter or Passover with your family! 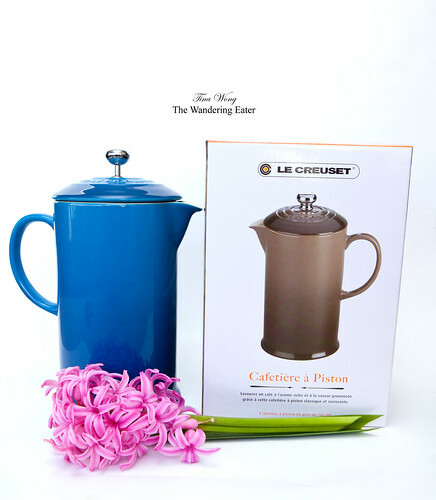 Since Easter and Passover is coming soon I’m going to make someone’s holiday a little more brighter by giving away the Le Creuset French press pot! (The one you see is the photos is color you are getting.) In order to enter, you have 4 ways to enter. The more you do, the better chances you will win this beautiful (and useful) pot. 3. E-mail me with your full name and an e-mail address that you will check. 4. Simply comment on this post (related to this content). Note: If you are intending to comment on this post and would like to mention what you’ve done (e.g. tweeted, e-mailed, and “Like” Le Creuset’s Facebook page), please condense this to 1 comment. (It’s a personal preference to keep it nice and compact.). Thank you! The giveaway will close at Thursday, April 5, 2012 at 11:59 AM (as in before lunchtime) and will be notified by e-mail. The winner will be chosen by Thursday, April 5, 2012 during the afternoon. Winner must reside within the U.S. and it will be shipped directly from Le Creuset. 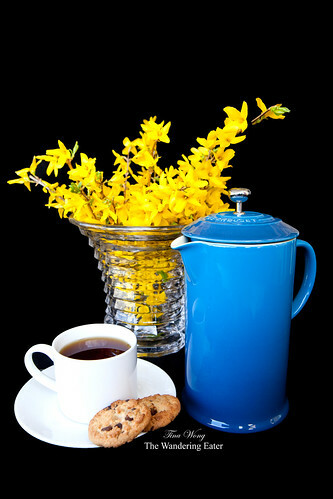 I love the Le Creuset French press pot and it’s in a beautiful, vibrant Marseille blue color. Do you think I might be the final winner of this beautiful French press pot? I like Le Creuset’s facebook page — and this Marseilles color is so beautiful! This is such a beautiful french press, in either color! I would so enjoy owing it. Actually, it could shatter or chip but not as likely as another brand who uses a clear, thin glass as its body. I absolutely love creuset products! I use my dutch over constantly! I only have a tiny single-serve French Press; I would love to upgrade! I liked Le Creuset’s facebook page! I currently have a Bodum french press, which I love – but the Le Creuset one is just absolutely gorgeous! Can we all just agree the fact that Le Creuset makes this is incredible? Getting really tired of my second rate Starbucks French press and the issues I have with the filter. I liked (why hadn’t I thought to do that sooner?) and tweeted. Now I’ll just wait for a beautiful blue French Press to show up on my doorstep. Man, I’ve been using a cone with a coffee filter for the past year +, but if I had one of those I would so surely go back to french press! I usually add four rounded tablespoons of coffee to our 24 oz French Press…maybe I need to add more for a boost of flavor! Thanks for the post. A Le Creuset French Press would look lovely in my kitchen! Thanks for commenting and entering this giveaway. I’ve altered and deleted two of your comments as I’ve stated, it’s not necessary to write multiple comments (too much clutter for me). One comment that mentions all actions (liking Le Creuset’s Facebook page, tweeting, etc.) is plenty sufficient. –>and this applies to everyone. My fiance loves french pressed coffee, I don’t think he could switch back to brewing in a coffee pot! This would make a wonderful gift for him! oops it double posted, I am sorry! I’m intrigued by the press method. My husband is getting into coffee but I don’t want to buy a drip coffee maker because I think it tastes bad made that way and I think he will too. I “like” the FB Le Creuset page! OK I love it! I have been wanting one of these presses for so long. I have a cheap one and i could never figure out just how to make the coffee just right. Thanks for the tips! French press coffee is definitely the best way to drink it. Working at Starbucks first introduced me to it. oh. my. i have just stumbled upon the dream french press. how did i have no idea? i am on the hunt for a non-plastic french press for my love, and this. this. is it. thank you! I like the Le Creuset facebook page. I liked Le Creuset on Facebook! Oh this would be a wonderful easter surprise!!! Great giveaway! Manda, thanks for entering and commenting on this post. I’ve modified and condensed your 3 comments to 1. Like I’ve said to other participants in this giveaway, please limit the comment to 1. It’s unnecessary clutter. Thanks. I like Le Creuset on Facebook! Oooo I love Le Creuset! I LOVE the color of this French Press! Gorgeous! And commenting here! Fingers crossed! Beautiful French press! Thanks for this opportunity! I would love the French Press!! So much fun! I like Le Creuset Facebook Page! I like le crueset’s facebook page! I love the blue color of the French press! This is a beautiful french press. I liked the facebook page, and sent you an email.